, or Raffaello, whose family name was Sanzio, was born in the city of Urbino, March 28, 1483. He was the only child of John Sanzio, a painter, who, though of no great professional celebrity, encouraged his son’s inclination for the art, and after having taught him what he could, had the good sense and diffidence in his own talents, to place him under the care of Peter Perugino, when in his thirteenth year. Perugino, who, from his style of design, pronounced that he would be a great man, regarded him with peculiar affection, and Raphael, during the three years that he remained with this artist, so | perfectly adopted his manner, that his works were not to be distinguished from those of his master; which was so far from creating any jealousy in the mind of the latter, that on the return of Raphael to Perugia, after his visit to Florence, he was the first to admire his works and proclaim his improvement. In 1499, at the age of sixteen, Raphael left Perugia, and went with Pinturicchio to Siena, to assist him in painting for the library of the cathedral, the history of Pius II. which was executed in ten large pictures, of which Raphael made the greater part, if not all the designs, and assisted in painting them. Before this work was completed, he left Siena, probably about 1502, to pursue his studies at Florence, where the great names of Leonardo da Vinci and Michael Angelo flourished with rival pre-eminence, and where he immediately became conscious of the inferiority of the style which he had been taught and practised. 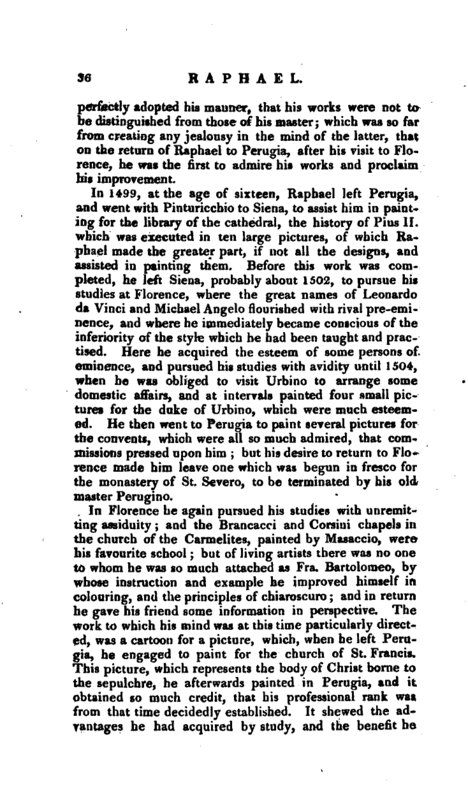 Here he acquired the esteem of some persons of eminence, and pursued his studies with avidity until 1504, when he was obliged to visit Urbino to arrange some domestic affairs, and at intervals painted four small pictures for the duke of Urbino, which were much esteemed. He then went to Perugia to paint several pictures for the convents, which were all so much admired, that commissions pressed upon him; but his desire to return to Florence made him leave one which was begun in fresco for the monastery of St. Severo, to be terminated by his old master Perugino. In Florence he again pursued his studies with unremitting assiduity; and the Brancacci and Corsini chapels in the church of the Carmelites, painted by Masaccio, were his favourite school; but of living artists there was no one to whom he was so much attached as Fra. Bartolomeo, by whose instruction and example he improved himself in colouring, and the principles of chiaroscuro; and in return he gave his friend some information in perspective. The work to which his mind was at this time particularly directed, was a cartoon for a picture, which, when he left Perugia, he engaged to paint for the church of St. Francis. This picture, which represents the body of Christ borne to, the sepulchre, he afterwards painted in Perugia, and it obtained so much credit, that his professional rank was from that time decidedly established. It shewed the advantages he had acquired by study, and the benefit he | derived from the friendship of Fra. Bartolomeo; for this was the first step he had taken to overcome the restraints of his previous education. When the picture was finished he again returned to Florence; was much sought after by men of taste, and with accumulated reputation his fame soon extended itself to the Vatican. Julius II. 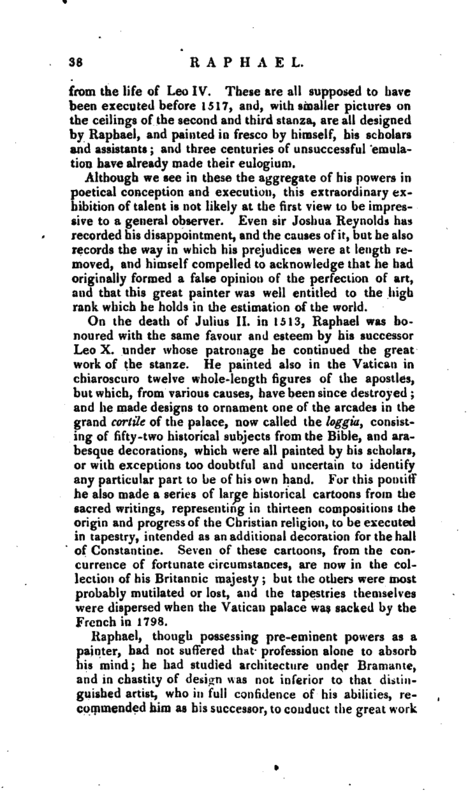 was then pope, a great patron of the arts, and having heard of Raphael, invited him to Rome in 1508, and received him. with the most flattering marks of distinction. Here being immediately commissioned to paint one of the state chambers of the Vatican, which the pope was then ornamenting with great taste and splendour, Raphael executed his “School of Athens,” which gave such entire satisfaction to the pope, that all the pictures by the various masters already painted in the different rooms, were ordered to be effaced, and the walls prepared to transmit to posterity his own unrivalted genius. The only work preserved from this general destruction was the ceiling of one of these rooms, the fourth in the suite, which had been painted by Perugino, and was saved at Raphael’s intercession. So amiable a trait of character ought not to be forgotten. This extensive undertaking, which it was for Raphael alone to plan and execute, he appears to have formed into one general design to shew the triumph of the Christian religion (in the catholic form), its divine authority, and the dependence of human laws on its pervading influence. But whether in this arrangement there was any refined system of metaphysics, intending to conduct man from a savage state by the paths of religion and philosophy to a more intimate union with the great first cause, must now be left to fanciful theorists, as neither the painter nor his contemporaries have left us any written data for speculation. 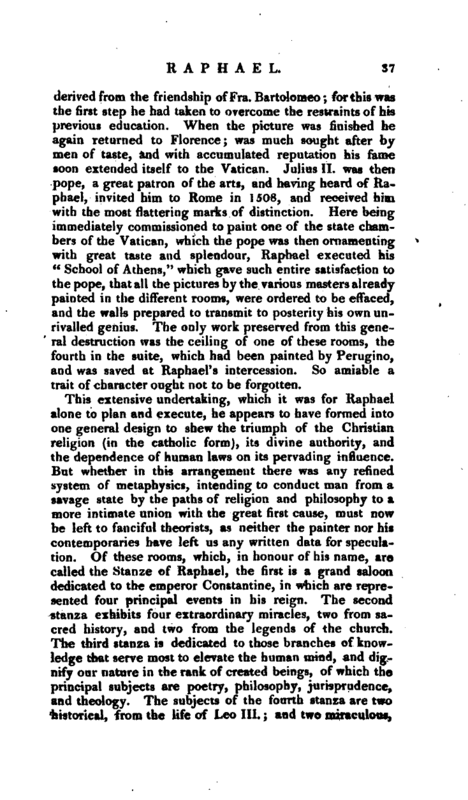 Of these rooms, which, in honour of his name, are called the Stanze of Raphael, the first is a grand saloon dedicated to the emperor Constantine, in which are represented four principal events in his reign. The second stanza exhibits four extraordinary miracles, two from sacred history, and two from the legends of the church. The third stanza is dedicated to those branches of knowledge that serve most to elevate the human mind, and dignify our nature in the rank of created beings, of which the principal subjects are poetry, philosophy, jurisprudence, and theology. The subjects of the fourth stanza are two kistorical, from the life of Leo III. ; and two miraculous, | from the life of Leo IV. These are all supposed to have been executed before 1517, and, with smaller pictures on the ceilings of the second and third stanza, are all designed by Raphael, and painted in fresco by himself, his scholars and assistants; and. three centuries of unsuccessful emulation have already made their eulogium. Although we see in these the aggregate of his powers in poetical conception and execution, this extraordinary exhibition of talent is not likely at the first view to be impressive to a general observer. 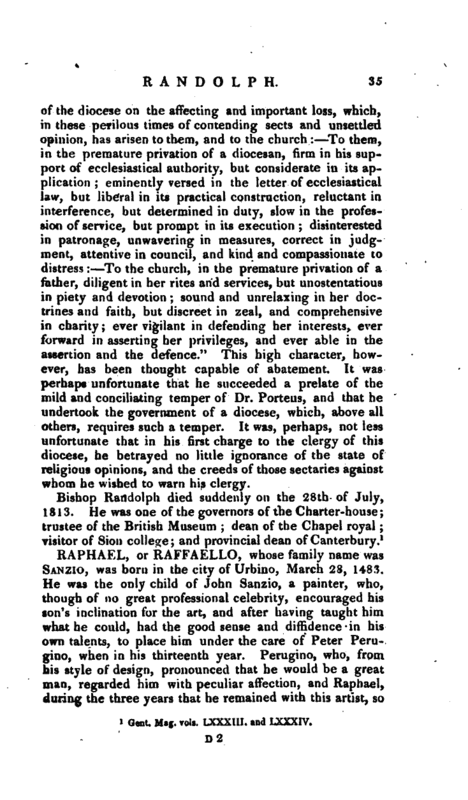 Even sir Joshua Reynolds has recorded his disappointment, and the causes of it, but he also records the way in which his prejudices were at length removed, and himself compelled to acknowledge that he had originally formed a false opinion of the perfection of art, and that this great painter was well entitled to the high rank which he holds in the estimation of the world. On the death of Julius II. in 1513, Raphael was honoured with the same favour and esteem by his successor Leo X. under whose patronage he continued the great work of the stanze. He painted also in the Vatican in chiaroscuro twelve whole-length figures of the apostles, but which, from various causes, have been since destroyed; and he made designs to ornament one of the arcades in the grand cortile of the palace, now called the loggia, consisting of fifty-two historical subjects from the Bible, and arabesque decorations, which were all painted by his scholars, or with exceptions too doubtful and uncertain to identify any particular part to be of his own hand. For this pontiff he also made a series of large historical cartoons from the sacred writings, representing in thirteen compositions the origin and progress of the Christian religion, to be executed in tapestry, intended as an additional decoration for the hall of Constantine. Seven of these cartoons, from the concurrence of fortunate circumstances, are now in the collection of his Britannic majesty; but the others were most probably mutilated or lost, and the tapestries themselves were dispersed when the Vatican palace was sacked by the French in 1798. Raphael, though possessing pre-eminent powers as a painter, had not suffered that profession alone to absorb his mind; he had studied architecture under Bramante, and in chastity of design was not inferior to that distinguished artist, who in full confidence of his abilities, recommended him as his successor, to conduct the great work | of St. Peter’s, to which recommendation his holiness paid due attention. According to the pope’s brief on this occasion, dated August 1515, his salary was fixed at three hundred golden crowns, or 150l. per annum. For so important an undertaking this sum would seem to be a very inadequate remuneration but, as his biographer observes, in our own country, one hundred and sixty years subsequent to this period, sir Christopher Wren did not receive more than 200l. per annum, for the building of St. Paul’s, which included draughts, models, making estimates and contracts, examining and adjusting all bills and accounts, with constant personal superintendance, and giving instructions to the artificers in every department. St. Peter’s, which cost more than a century to complete, underwent so many changes by the various architects employed, that it would be now extremely difficult to particularize with any degree of certainty the different parts of it which were executed by Raphael. It appears, however, that it is to him we are indebted for the general plan of the church as it now exists. In 1515, Raphael went with the pope to Florence, and made a design for the facade of the church of St. Lorenzo: and, according to Vasari, he was also the architect of a magnificent house for the bishop of Troja, which still exists in the street of St. Gallo in that city; but of the different buildings designed or executed by Raphael, that on which his reputation as an artist is thought principally to rest, is the Caffarelli palace at Rome. The other buildings of Raphael still existing are, a palace for M. Giovanni Baptista dell‘ Aquila, opposite to the church of S. Maria della Vallicella, in Rome; a villa for cardinal Julius de Medici, afterwards pope Clement VII. 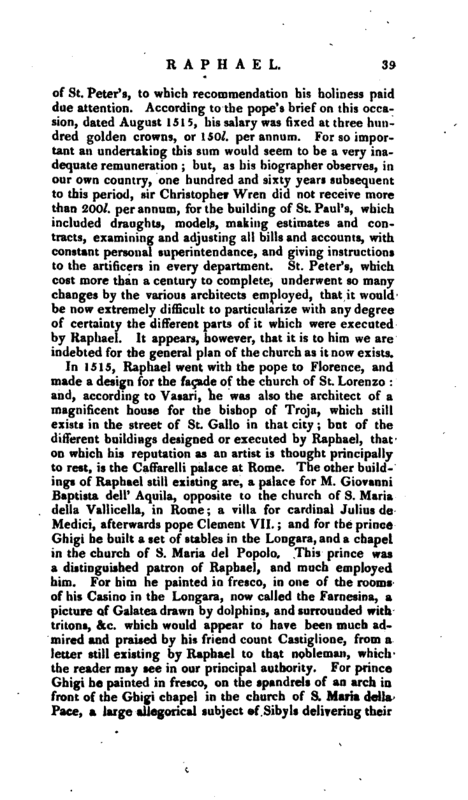 ; and for the prince Ghigi he built a set of stables in the Longara, and a chapel in the church of S. Maria del Popolo. This prince was a distinguished patron of Raphael, and much employed him. For him he painted in fresco, in one of the rooms of his Casino in the Longara, now called the Farnesina, a picture of Galatea drawn by dolphins, and surrounded with tritons, &c. which would appear to have been much admired and praised by his friend count Castiglione, from a letter still existing by Raphael to that nobleman, which the reader may see in our principal authority. For prince Ghigi he painted in fresco, on the spandrels of an arch in front of the Ghigi chapel in the church of S. Maria della Pace, a large allegorical subject of Sibyls delivering their | prophecies for the confirmation of the revealed religion. This work was highly esteemed when finished; but is now unfortunately much injured, and parts are entirely effaced. For his Casino in the Longara, Raphael made a series of designs from Apuleius’s history of Cupid and Psyche, which were painted by himself and his scholars on a ceiling of a spacious hall. What part was painted by himself it would not be easy at this time to ascertain, as the work has suffered much by being originally exposed to the open air, as the loggia of the Vatican is at present, and by being repainted and repaired. In the church of St. Auguslin, Raphael painted in fresco, on one of its piers, the prophet Isaiah, intended as the commencement of a series of pictures to ornament that church, but some dispute arising concerning the expence, the fathers relinquished their design; a loss much to be regretted, as the style of this picture is equal to his best works. This dispute concerning the price is said to have been referred to Michael Angeio to adjust, who settled it in one word, by telling the fathers that the knee alone was worth more money. Raphael also decorated his own villa in Rome, which now belongs to the cardinal Doria, with arabesque ornaments, a group of figures shooting at a target, and a small historic;*! subject, called the Marriage of Roxana. Raphael was not only eminent as a painter and an architect, but he was desirous to emulate the reputation of his great contemporary, Michael Angelo, in being a sculptor also. We are informed that, with his own hand he executed some statues, but one only is referred to by the anonymous author of the Milan ms. which was the statue of a child, then in the possession of Julio Romano; and of this statue there can be no doubt, as it is also recognized by count Castiglione, in a letter of the year 1523; but what became of it is not known. There is, however, in the Ghigi chapel in the church of S. Maria del Popolo, a statue of Jonah from his own model, and executed in marble, under his immediate direction, by Lorenzetto, which remains an extraordinary instance of the versatility of his powers, as this specimen of sculpture may fairly rank with the best productions of modern Rome. 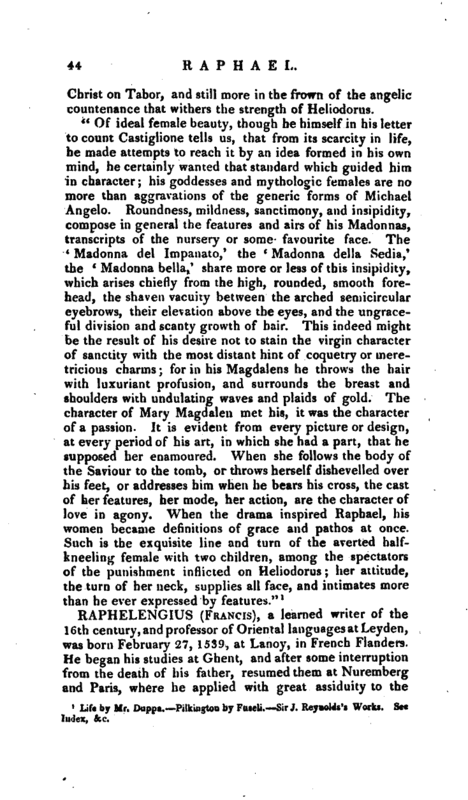 In the midst of his professional reputation, Raphael was equally caressed by the learned and the great, many instances of which are given by his late biographer, Mr. | Duppa, whose elaborate narrative we principally follow. LeoX. regarded Raphael with the highest esteem; he was much about his person, was made groom of the chamber, and is even said to have had reason to expect the honours of the purple, which is the alleged cause for his not marrying the niece of cardinal di Bibbiena, who was desirous of the alliance. 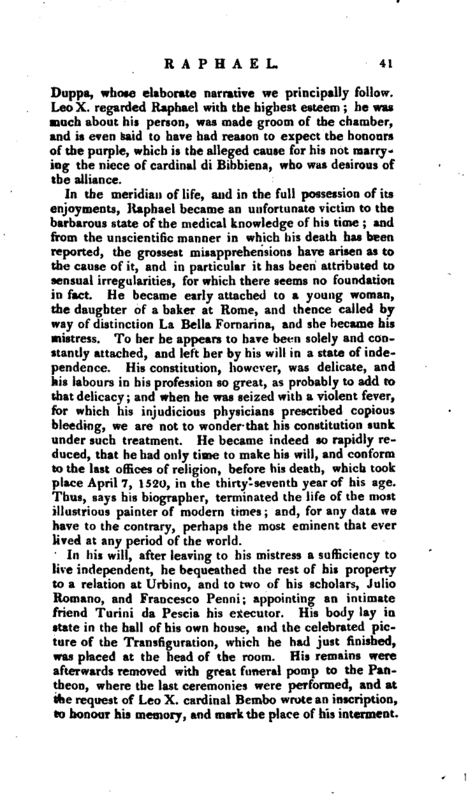 In the meridian of life, and in the full possession of its enjoyments, Raphael became an unfortunate victim to the barbarous state of the medical knowledge of his time and from the unscientific manner in which his death has been reported, the grossest misapprehensions have arisen as to the cause of it, and in particular it has been attributed to sensual irregularities, for which there seems no foundation in fact. He became early attached to a young woman, the daughter of a baker at Rome, and thence called by way of distinction La Bella Fornarina, and she became his mistress. To her he appears to have been solely and constantly attached, and left her by his will in a state of independence. His constitution, however, was delicate, and his labours in his profession so great, as probably to add to that delicacy; and when he was seized with a violent fever, for which his injudicious physicians prescribed copious bleeding, we are not to wonder that his constitution sunk under such treatment. He became indeed so rapidly reduced, that he had only time to make his will, and conform, to the last offices of religion, before his death, which took place April 7, 1520, in the thirty-seventh year of his age. Thus, says his biographer, terminated the life of the most illustrious painter of modern times; and, for any data we have to the contrary, perhaps the most eminent that ever lived at any period of the world. In his will, after leaving to his mistress a sufficiency to live independent, he bequeathed the rest of his property to a relation at Urbino, and to two of his scholars, Julio Romano, and Francesco Penni; appointing an intimate friend Turini da Pescia his executor. His body lay in state in the tall of his own house, and the celebrated picture of the Transfiguration, which he had just finished, was placed at the head of the room. His remains were afterwards removed with great funeral pomp to the Pantheon, where the last ceremonies were performed, and at the request of Leo X. cardinal Bembo wrote an inscription, to honour his memory, and mark the place of his interment. | These particulars we have selected from the best life of this great artist that has appeared in this country, written by R. Duppa, esq. 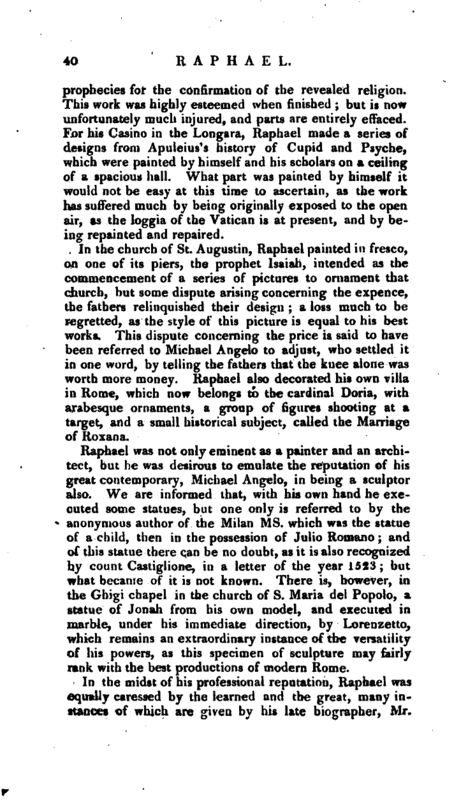 and prefixed to his splendid publication of “Heads from the Fresco pictures of Raffaello in the Vatican,” 1802, as a companion to his “Heads of Michael Angela*” Mr. Duppa concludes with a critical essay on the merits of Raphael, too long for our limits, and too valuable to be injured by abridgment. In Sir Joshua Reynolds’ lectures are many interesting and important observations on the same subject, which in truth must enter deeply into every discussion on the art. We might refer likewise to Opie’s lectures, Barry’s works, and other authors who have professedly or incidentally treated of Raphael. 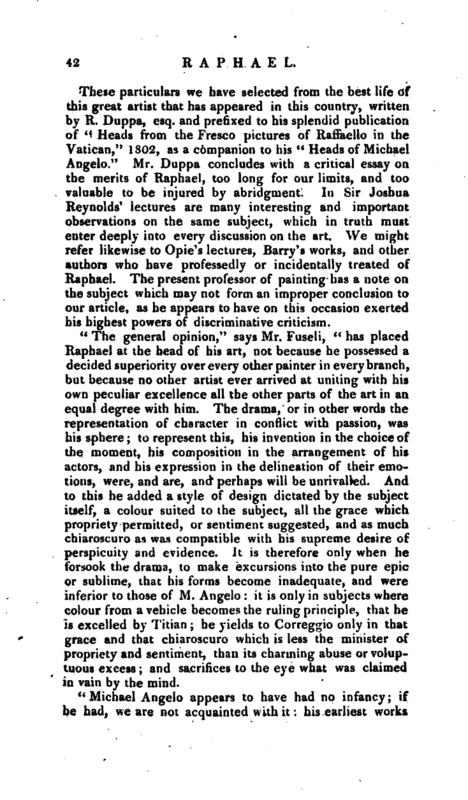 The present professor of painting has a note on the subject which may not form an improper conclusion to our article, as he appears to have on this occasion exerted his highest powers of discriminative criticism. “The general opinion,” says Mr. Fuseli, " has placed Raphael at the head of his art, not because he possessed a decided superiority over every other painter in every branch, but because no other artist ever arrived at uniting with his own peculiar excellence all the other parts of the art in an equal degree with him. The drama, or in other words the representation of character in conflict with passion, was his sphere; to represent this, his invention in the choice of the moment, his composition in the arrangement of his actors, and his expression in the delineation of their emotions, were, and are, and perhaps will be unrivalled. And to this he added a style of design dictated by the subject itself, a colour suited to the subject, all the grace which propriety permitted, or sentiment suggested, and as much chiaroscuro as was compatible with his supreme desire of perspicuity and evidence. It is therefore only when he forsook the drama, to make excursions into the pure epic or sublime, that his forms become inadequate, and were inferior to those of M. Angelo: it is only in subjects where colour from a vehicle becomes the ruling principle, that be is excelled by Titian; he yields to Correggio only in that grace and that chiaroscuro which is less the minister of propriety and sentiment, than its charming abuse or voluptuous excess; and sacrifices to the eye what was claimed in vain by the mind. ``Michael Angelo appears to have had no infancy; if he had, we are not acquainted with it: his earliest works | equal in principle and elements of style the vigorous offsprings of his virility: Raphael we see in his cradle, we hear him stammer; but propriety rocked the cradle, and character formed his lips. Even in the trammels of Pietro Perugino, dry and servile in his style of design, formal and gothic in his composition, he traced what was essential, and separated it from what was accidental, in figure and subject. The works of Lionardo, and the cartoon of Pisa, invigorated his eye, but it was the antique that completed the system which he had begun to establish on nature. From the antique he learned discrimination and propriety of form. He found that in the construction of the body, the articulation of the bones was the true cause of ease and grace in the action of the limbs, and that the knowledge of this was the true cause of the superiority of the ancients. He discovered that certain features were fittest for certain expressions and peculiar to certain characters; that such a head, such hands, and such feet, are the stamen or the growth of such a body; and on physiognomy established uniformity of parts. 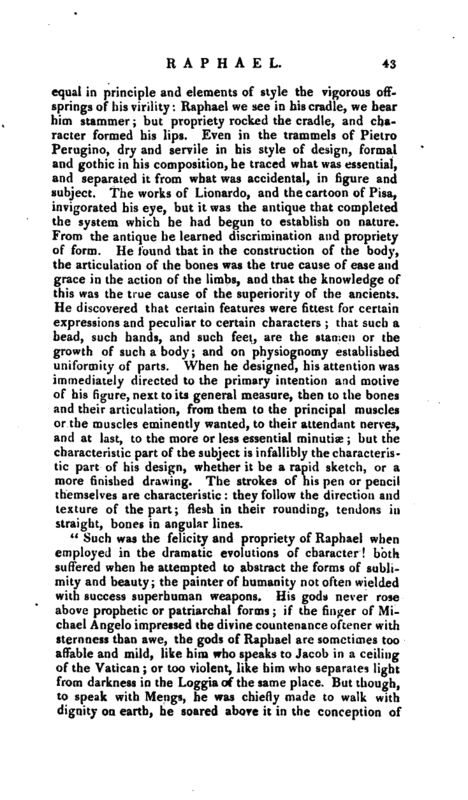 When he designed, his attention was immediately directed to the primary intention and motive of his figure, next to its general measure, then to the bones and their articulation, ’from them to the principal muscles or the muscles eminently wanted, to their attendant nerves, and at last, to the more or less essential minutiae; but the characteristic part of the subject is infallibly the characteristic part of his design, whether it be a rapid sketch, or a more finished drawing. The strokes of his pen or pencil themselves are characteristic: they follow the direction and texture of the part; flesh in their rounding, tendons in straight, bones in angular lines. ``Such was the felicity and propriety of Raphael when employed in the dramatic evolutions of character both suffered when he attempted to abstract the forms of sublimity and beauty; the painter of humanity not often wielded with success superhuman weapons. His gods never rose above prophetic or patriarchal forms; if the finder of Michael Angelo impressed the divine countenance oftener with sternness than awe, the gods of Raphael are sometimes too affable and mild, like him who speaks to Jacob in a ceiling of the Vatican; or too violent, like him who separates light from darkness in the Loggia of the same place. But though, to speak with Mengs, he was ohiefly made to walk with dignity on earth, he soared above it in the conception of | Christ on Tabor, and still more in the frown of the angelic countenance that withers the strength of Heliodorus. 1 Life by Mr. Duppa. Pilkington by Fuseli. Sir J. Reynolds’s Works. See Index, lee.